Critical Mass is an exclusive publication of Omnilert. Each installment features a wealth of information on the challenges, trends, and innovations that are changing the way we reach people during moments of crisis and save lives. Volume 3: "Automating Emergency Notifications"
In this edition, you will learn how Scenarios can equip you to launch a complex series of emergency response actions automatically; including delivering emergency procedures to each recipient, summoning assistance from local first responders and establishing a remote unified command. Volume 2: “The Most Important Minute"
What have you done to prepare for disaster? Are you as ready as you can be? The first minute is the most important one. In this volume, we explore what you can do to make that minute predictable and successful. 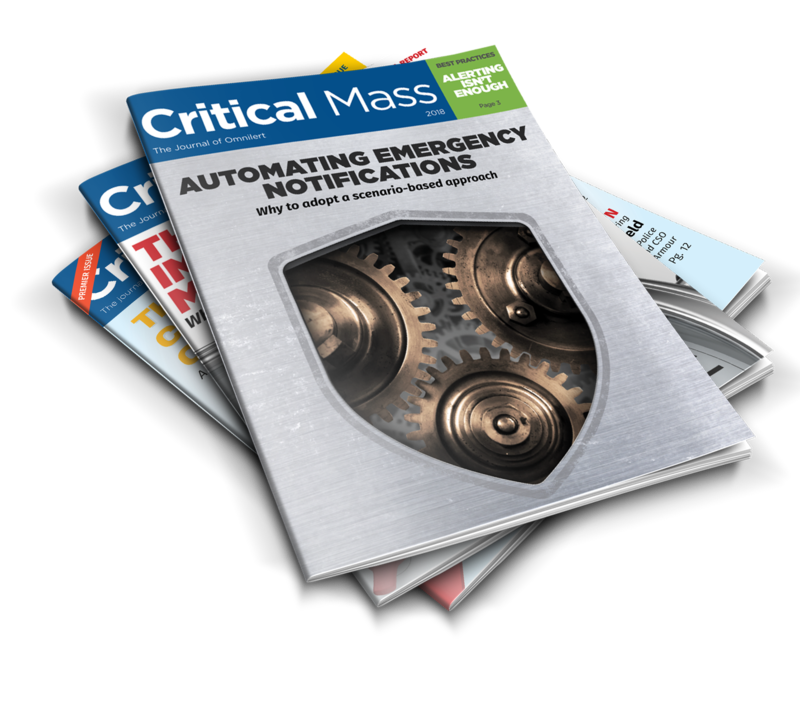 In the premier volume, learn how a holistic approach to emergency communications can improve your response times and elevate your chances for a successful outcome. You’ll also learn about some “inspired” campus safety solutions.